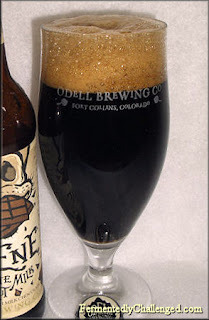 A new beer from Odell Brewing is the subject of the 1st of several collaborative beer reviews from the bloggers of Fermentedly Challenged (Dave Butler) and Brewtally Insane (Mark Robinson). 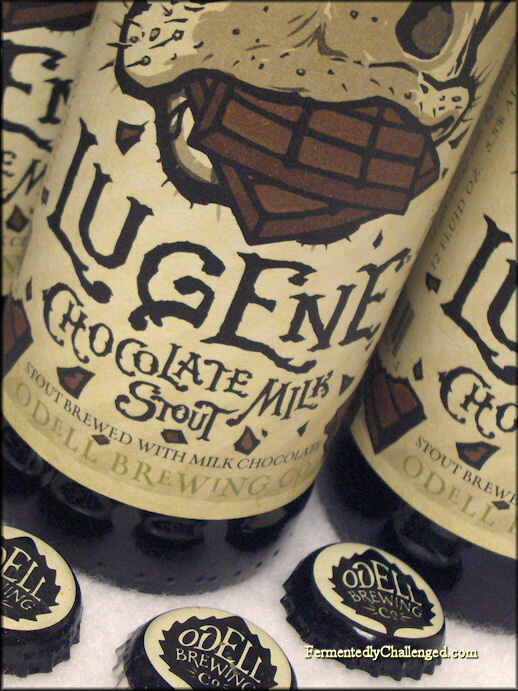 Here we will compare notes during a simultaneous beer review of Odell Brewing Company's newest release: Odell Lugene Chocolate Milk Stout. 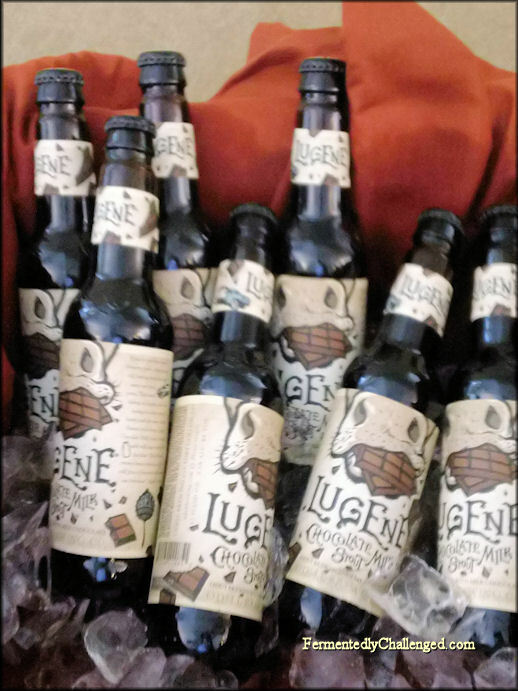 Lugene is a new member of the Odell family and was recently released on January 3rd, 2013 as part of their new 4-Pack Series. 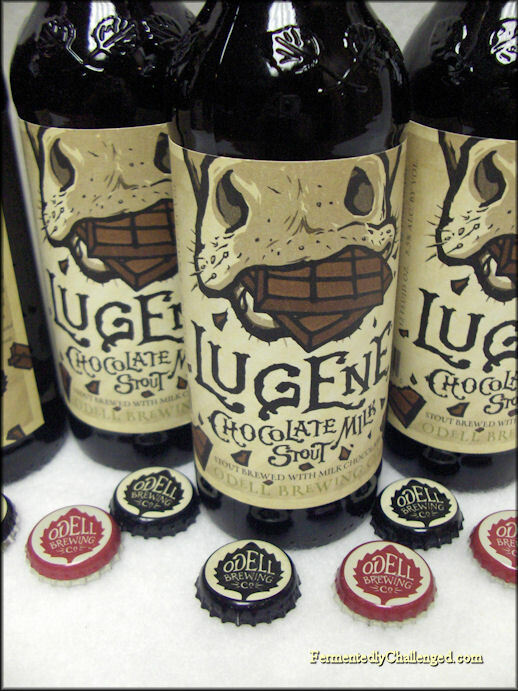 Odell Lugene Chocolate Milk Stout was brewed not only with milk sugar, but also with a generous amount of milk chocolate to give this big 8.5% ABV beer a wonderful choco-boost. Both Dave and Mark had previously tried samples of this beer up at the 2013 Big Beers, Belgians & Barleywines Festival in Vail over January 11-12 and thought it would be a great subject for a collaborative review. 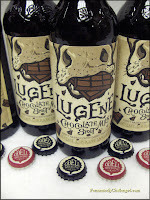 So far in 2013, Lugene Chocolate Milk Stout has been a big seller. Many stores have a hard time keeping this beer in stock as it has become popular with all kinds of beer drinkers. This beer will be available January through March and hopefully be returning annually. The following collaboration review effort is a "Brewtally Challenged" or perhaps a "Fermentedly Insane" twin look at this newest 4-Pack seasonal from Odell. For this collaborative review, Dave and Mark hooked up "screen to screen" via Facebook Messaging and simultaneously reviewed Odell's Lugene in Greeley and Aurora, Colorado. The following is an edited transcript of their shared review on January 22nd, 2013. Dave Butler (DB): Hey Mark - I'm online. Got the bottle of Lugene out of the fridge and letting it warm up a bit. Let me know when you are ready to start. Mark Robinson (MR): OK, game on. What type of glass are you using? MR: Found it for $8.99 down here. (Aurora) It's been a popular seller. Been going quickly. DB: I need to get me a cheaper store! So what did you think overall of the packaging Odell used? MR: Love the artwork, interesting story. I like the fact that they're paying tribute to a long-time "employee". DB: The grain story was nice. Interesting how they put in a big bucket of milk chocolate into the brew kettle too. MR: Yeah, that picture yesterday was pretty awesome. Looked like it was gooey chocolate. Yummy. DB: This is a bigger beer than I thought it would be. At 8.5% ABV this may even qualify for cellaring. I'm going to put some away for a year and hopefully compare it to next years. MR: Dark brown, almost black in color. Head lasted about 3 seconds and fizzled away. DB: I used a semi-aggressive pour and got a big 3 finger brown head with lots of big bubbles and sticky lacing. Color is dark as night - with just a hint of mahogany edges around the glass. MR: Yeah, lacing looks good. I get the mahogany. Looks creamy and inviting. DB: What glass did you use on yours? What temperature is yours about? Mine was a bit too cold initially so I let it warm up for 30 minutes. MR: Same. it's a Fischer glass, but same shape. I'm guessing, but around 55-60 degrees. It's not cold, cold. I put it in the fridge about an hour ago and pulled it out 10 minutes ago. I figured a chocolate beer would be dark. I like that this one is more pronounced. DB: It's not oil thick dark, but dark enough to hide just about everything inside. 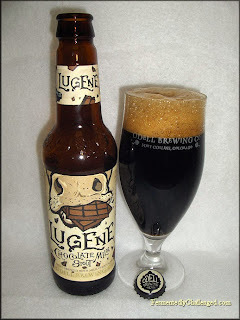 Odell's Lugene at least has some good "darkness" about it. MR: I'm getting big, sweet milk chocolate. I home-brewed a chocolate oatmeal stout about 5 years ago and it had that bitter, cooking chocolate smell. this is more like a fine piece of rich Godiva. Divine. I also get peanuts, like Reese's cups. MR: Yeah, more like the Reese's peanut butter cup aroma than peanuts I guess. DB: It's not nutty like peanut butter, but the rich chocolate from a candy bar does come through. DB: It's always tough to pick out a hop aroma in a stout like this. With all the other things going on here, I can pick up a hint of bitterness in the nose, but not much. Some stouts have a coffee-like scent. I don't get that in here. Milk sugar has a noticeable sweetness all its own. MR: Yeah, there's the slightest presence of hops, but it's hidden. Agree, no coffee. Get a touch of vanilla too. DB: Toffee perhaps, like a heath bar. With the higher ABV, I pick up a hint of the alcohol, but not as rough as in some imperial stouts. Would you say this might border on an imperial stout aroma? MR: It's a big beer, but it doesn't smell hot. It feels like it'll have that bold imp stout flavor though. Not exactly Dark Lord or anything huge like that, but big nonetheless. Speaking of which, I'm thirsty. cheers? DB: Cheers! (glug glug glug...) Texture is full, creamy and smooth. Also a bit on the drying side. MR: Yeah, it's on the thick side, which I think is perfect for a beer like this. I think too many stouts fall short by being watery and thin. Very creamy, dangerously smooth. I like the rich, melted candy bar flavor. DB: First thing I got was a semi-sweet chocolate taste. Reminded me of baking chocolate with some additional sweet in there. The beer was more sweet than bitter. Smooth going down. The roast is subdued also. The chocolate really comes through on this. Definitely like a dessert beer. Can't really pick up on the higher ABV initially. It's well hidden, probably one to sneak up on you. MR: Seems like this would go well with strawberries or a fruity cheesecake. DB: This beer is also what I refer to as a tongue coater. Leaves a nice coating over the tongue that lingers. Can taste the chocolate long after it's gone. Ya, I could go for some cheesecake right about now. Any negatives for you? For me, Milk Stouts come in 2nd behind other styles of stouts, but the chocolate flavor is changing the way I look at this milk stout. I can still pick up on the milk lactose sugars, if not for the chocolate they can get a bit too sweet. MR: Yeah, despite being full flavored and a higher ABV, there's really not much of an alcohol presence. Yeah, it's got that milky, creamy coating in your mouth. not necessarily oily, but big and creamy coating. touch of bitter hops on the tongue. DB: Do you think this beer would stand up to aging? Being 8.5% I think it would weather well in a cellar. This beer tastes even better as it warms too. Now that it's nearing 60 degrees it is still tasting real good and the chocolate comes out more. Yes, the bitterness hits the tip. MR: It's obviously very sweet. It's a 1 (or 2) and done kind of beer for me. I can't see myself having more than that in a sitting. I could see it benefiting from a little age. I used to age Southern Tier's Crème Brûlée stout. That thing is super sweet. Too sweet. A year or two might mellow it out. Truthfully, I think it's solid right now, but I'd still be curious to see what a year would do to this beer. DB: I think 1 would be plenty, although I might go for 2. But no more than that. This beer is starting to give a nice warming effect. The sweetness may mellow a bit in a year as well as some of the bitterness. Wonder if there is enough yeast in there to eat up more of this milk sugar. MR: I definitely like it better at a warmer temp. We had some at a tasting when it first came out and it was in an ice bin. Didn't do much for me. Tonight tastes pretty good though. I've got a good line of sediment in my bottle. MR: Odell Lugene chocolate milk stout ice cream float? DB: Oh hell yes! Love to make Beer Floats. Especially with big stouts. Chocolate or toffee or vanilla ice cream. I don't have any sediment that I can see in my bottle, but I did pour the entire contents into my glass. Wow, just noticed. I'm near the bottom of my glass and the aroma on this beer has changed a bit. I'm getting a lot more dark roast now than before. As it warms the malts are really fighting past the chocolate. It's nice. DB: So overall impressions of this beer. How would you compare it to other similar beers you've had? MR: I like this one. It's sweet, but it's not too much. You drink a chocolate milk stout and you expect these flavors, but they're not too big that they turn you off and they're not too small that you're hunting around with your nose crammed in the glass trying to find some sign of chocolate. It's good. rich, thick, creamy, bold and flavorful. I wish I had some vanilla ice cream. A float or milkshake sounds awesome right about now. DB: I liked this beer a lot more than other milk stouts I've tried. Usually the milk sugars change the taste to much too sweet and it almost ruins it, but this one didn't do that. It kept a low sweetness, bitter sweet, and the chocolate took center stage. The malts eventually came through more in the end. Overall, very satisfying. I can see why the masses are really liking this beer. MR: Do you know if this is going to be a returning seasonal or what their plans are for it? DB: This beer should return next year January through March I believe. Being so popular thus far and selling out quick, I don't see why Odell wouldn't make this again. I'd love to see what this could do in an oak barrel too. Did you have Lugene and the tiramisu dessert at Big Beers? I thought that was an excellent pairing also. MR: No. We didn't hit any of the events outside of the commercial tasting. need to fix that next year. Barrel-aging would be interesting. I fear the barrel characteristics would take over too much of the chocolate presence. Still, I'm curious. that's a good idea. Rum barrels would be good I think. DB: Perhaps you are right about the barrels. Too much wood might ruin the great chocolate taste. But would still be curious to see how it would turn out. Rum or bourbon. MR: The vanilla from the rum. Oh daddy. That could be nice. DB Vanilla bean chocolate milk stout! DB: May have to beg a recipe out of Odell for this. My beer is gone. Wonderful brew. Glad I have 7 more. MR: I'm getting low. have 3 left. Debating on drinking another and saving some for that ice cream float. My wife would like to try it I'm sure. MR: Cheers my friend. I'm comparing (Lugene) in my mind to Old Rasputin. We've had that in our kegerator for about two months and it ran out earlier this week. I like the beer, good price point, but it was just a tad on the thin side. We had Yeti last winter and that was almost too much. Love the Yeti, but it's soooo big and thick. 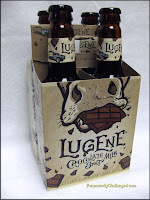 Lugene is a nice middle of the road, but with a chocolate presence to make it stand out on its own. DB: I've had Old Rasputin before, it was much stronger and less sweet than this beer. 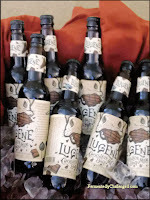 I wouldn't say Lugene was much like an impy stout, but it did have a lot of flavor, some roast, lot of chocolate too. Don't get a ton of chocolate in some impy stouts, but ones like Deschutes The Abyss had a lot of chocolate flavor. DB: Enjoying this second Lugene. Thanks for sharing the tasting. Had fun. Let's do it again. Good talking to you Mark. Keep in touch. Always fun to talk beer with another beer enthusiast and blogger. Cheers! MR: Good to talk. We'll be in touch! Looks like Odell has another solid beer here with Odell Lugene Chocolate Milk Stout. It's a beer that will appeal to a wide variety of craft beer drinkers. I'm glad I bought two 4-packs of this as I intend to age some of these in my cellar to see how it does over time and to eventually do a vertical tasting with next year's batch. 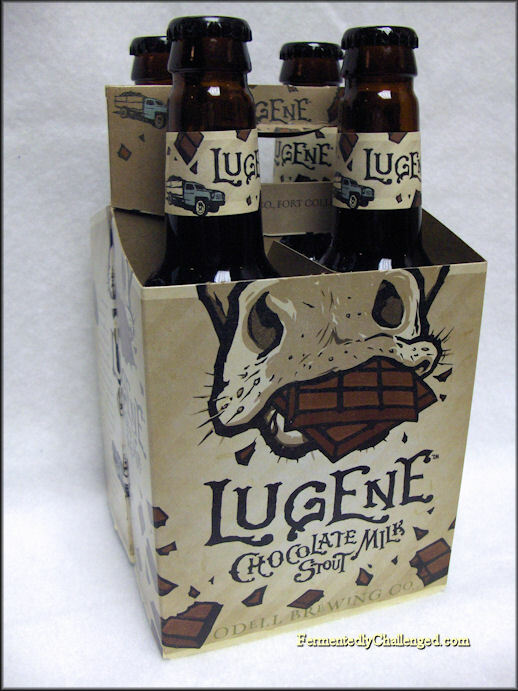 Look for a cellar report somewhere down the road next year when Lugene hits shelves in 2014. While I don't normally repeat buy too many craft beers due to the desire to try as many different beers as possible, this is one of the few that I'll probably buy on a regular basis when it is available. Collaboration beer reviews are a lot of fun. Get some friends together and all try the same beer together and compare notes. You may be surprised what some people pick up in a beer and some of the ideas they have for possible food pairings. Mark Robinson is the writer for the Colorado-based beer blog Brewtally Insane and initially approached me to do a side-by-side beer review of this beer. You can read his review of this beer here later today. Follow him on Facebook too. - Got Chocolate Milk Stout? Odell does.